California has allocated five times more surface water than the state actually has, making it hard for regulators to tell whose supplies should be cut during a drought, University of California researchers reported. The scientists said California’s water-rights regulator, the State Water Resources Control Board, needs a systematic overhaul of policies and procedures to bridge the gaping disparity, but lacks the legislative authority and funding to do so. Ted Grantham, who explored the state’s water-rights database as a postdoctoral researcher with the UC Davis Center for Watershed Sciences, said the time is ripe for tightening the water-use accounting. “Given the public’s current attention on drought and California water, we now have an unprecedented opportunity for strengthening the water-rights system,” said Grantham, who conducted the analysis with UC Merced Professor Joshua Viers. Better information might enable state regulators to better target water cutbacks in times of drought, Grantham said. Grantham and Viers verified that water-rights allocations exceed the state’s actual surface water supply by about 300 million acre-feet, enough to fill Lake Tahoe about 2.5 times. The state has allocated a total maximum allowable use of 370 million acre-feet of surface water — more than five times the 70 million acre-feet available in a year of good precipitation, according to the researchers’ review of active water rights on record. The analysis was published today (Aug. 19) in the journal Environmental Research Letters. 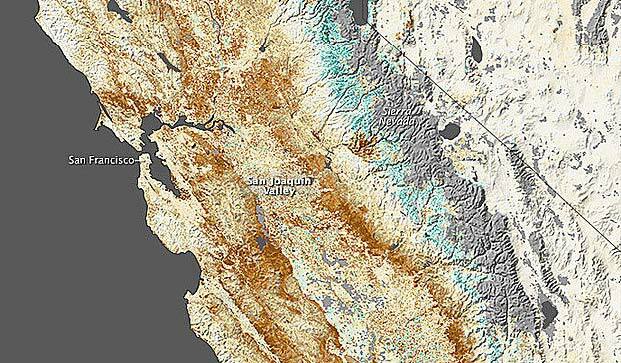 The scientists said the California’s water-rights allocation system is complicated and backlogged, which contributes to the mismatched accounting. For example, people sometimes take water, apply retroactively for the right to use the water and continue taking it — sometimes for up to a decade — while their applications are pending. Inaccurate reporting by water-rights holders worsens the problem. Some may even deliberately overestimate so they do not lose as much if cutbacks occur. The result is that in most water basins and in most years, far more people hold water rights than there is water. In the San Joaquin River basin, for example, water-rights allocations exceed the river’s average annual flow by eightfold. During the current drought, the state water board has for some watersheds ordered curtailments for all water users, to protect fish. Viers and Grantham, now with the U.S. Geological Survey, are working to iron out issues with its database and make the information available to policymakers.